And for good reason. I still believe that adrenal fatigue is one of the biggest “unknown” health crises facing us right now. Our adrenal system affects our entire health picture because our adrenals control all our hormones. If our adrenals are not healthy, we face chronic stress, infertility, diabetes (insulin is affected), and who knows what else! Getting our adrenal health under control should be a priority for everyone. Knowing what to do is not always easy, so I’m going to discuss a few things here (some of which I’ve done personally and have found have really helped). This diet isn’t very different from a typical healthy diet. The only difference is limiting fruits, really. It’s also important to be more vigilant than usual about avoiding junk and consuming only nourishing foods. Those with adrenal fatigue will crave fat and salt. There is a reason for this! Your body needs the high-quality fats and salts to improve. Sodium levels are often lower in people with adrenal fatigue, so your body needs more in order to recover. A homemade electrolyte drink is the best way to get this, as commercial drinks are full of sugar, artificial flavors and colors, and other junk. It is important not to drink too much water because plain water can further throw off your electrolyte balance by providing too much fluid and not enough sodium! If you are drinking as much as the “experts” say, so that your urine is clear and you are needing to go every hour or so, you are drinking too much! You may even feel thirstier and also like water isn’t hydrating you. Mix all ingredients together and sip on this throughout the day. You can drink as much as you like. I’ve been drinking this almost every day for a few weeks now and have noticed it really helps. You can also add a pinch of salt to anything else you’re drinking, too (smoothies, plain water, fresh-pressed juice — cranberry juice is very good for you!). Get to bed at a reasonable hour. This means between 10 and 11 each night. Take time to relax before bed, perhaps with a book or a cup of tea (I like ginger). Start winding down by 9 so that you are ready for bed by 10 or so. Remove unnecessary stress from your life. Avoid negative people and situations whenever possible. Take time each day to breathe, pray, and relax. You can recover from adrenal fatigue, and enjoy excellent health! For myself, I followed my food cravings. This meant a lot of sea salt, butter, bacon, and cheese. I craved fat, primarily from dairy. I cut the last bit of junk I was still indulging in, and whenever we were out, I’d bring food with me or select a restaurant with appropriate options (more on that coming hopefully soon…I know it’s a struggle to find where and what to eat while out!). I focused on myself and my healing. Every night I sat down by 9 or 9:30 to read (Nourishing Traditions!) and have a cup of ginger tea, and sometimes a small snack (sprouted bread with butter, slices of raw cheese, etc.). I went to bed by 10:30 or so. I concentrated on clearing my mind of unimportant things, telling myself I would get to them the next day (at night). At bedtime, I would tell myself “Tomorrow is time enough,” referring to all the “should haves” that were still in my head. The result was that in only a few weeks I began to feel better. I fell asleep quickly at night and went back to sleep easily after my son woke me (we’re ” sleep training” him now, gently, with no crying…more on that later too). I woke to feel generally rested. This was true even if my son had me up several times: I’d still feel tired, but it was a recognizable, I-got-woken-by-the-baby tired, not an I-didn’t-get-refreshing-sleep tired. For more information, please click on all the links I’ve included in this post! There’s a lot more research out there backing up what I’ve said, both here and in my original post. It’s very important that you understand this and the health implications! Have you specifically used an adrenal health diet to heal, or prevent adrenal fatigue? Thank you for the link love! I am sad I didn't discover this information about zucchini until the end of summer squash season, but hopefully I will luck out at the market this Saturday and find some of the last ones. My adrenal fatigue story is a long one. Condensed, I basically went to the Dr two years ago to get help sleeping. I've always struggled to get a good night's sleep but thought it was because my husband worked nights. Now that I'm married to a "normal" man the problem persisted and even got worse. Dr just wanted to put me on meds. I was desperate enough to give them a reluctant try, but they made the problem worse. I even went for a sleep study, which was interesting, but did nothing to improve the quality of my sleep. Two months later I went to a new chiropractor for an unrelated (I thought) issue. He gave me a lengthy questionnaire to fill out and then told me I had adrenal fatigue. I'd never heard of it, but when I researched online I found ALL of my seemingly insignificant health issues were a result of AF. It turned our lives around! I feel sad that it's been nearly two years since discovering this and I'm not doing much better. Giving up sugar is a real struggle for me, though I've cut back considerably and replaced a portion with less refined sweeteners. After reading your posts here I may commit to a week w/o and see if I notice an improvement. We have dairy goats, so I have raw full fat dairy, but this time of year they drop production. We also have chickens, so I have fresh eggs as often as I like. I take coconut oil in the morning though my goal is 3 times per day-I just can't remember once the day gets going. One question for you-is butter from pastured cows still good even though the milk/cream has been pasteurized? I'm overwhelmed just replying! I found the info at http://www.womentowomen.com to be helpful, though they're unable to confirm if their vitamin supplements are synthetic or naturally derived. I'm trying their Adaptisol, but again can't remember to take it 3 times per day! 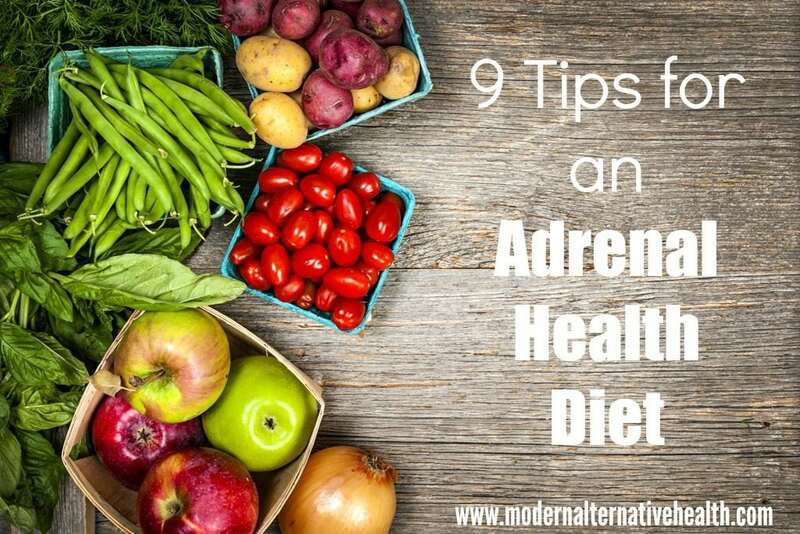 Wonderful ideas on easy diet related ways to deal with adrenal fatige! I started taking a supplement called Adrenalstart by Nutristart, and while i love this product, other folks may find it interesting in itself, or for an ingredient list. It was a night and day difference, after about 4 days my energy level every day was like the occasional time when I would have a really good day. Usually it was a struggle to get the basics done. I am so thankful that a friend suggested to me that my adrenal system was plain old worn down. It was/ is a great kickstart. issues. Have an a tumor removed on my pituatary gland also. Thanks. I have every adrenal book written sitting on my shelf because I have been so desperate to find a fix. After a while, they all seemed to say the same thing and I was doing everything that was recommended, but still was housebound. And every time I tried one of the supplements the different books recommended, I would end up worse. My adrenals simply couldn't handle the licorice, ashwaganda, holy basil, etc. A couple of weeks ago, I came across Cheeseslaves's blog where she mentioned having success with the suggestions in "The Mood Cure." I sent my husband to pick up the book for me that very day. I had such a light bulb moment when I started reading it!! I had been doing everything right, the sleep, the diet, the reduces stress inducers….why wasn't I better? The book explained it! It was such a light bulb moment for me. Amino acids and a balance in our brain. My brain was the only thing I hadn't addressed in adrenal fatigue. There is a test in the book that guides you to what aminos you may be lacking and why your body can't heal itself. I immediately ordered GABA, tyrosine, DLPA and glutamine (the nutrients I need based on the test in the book) and the results have been amazing!! I feel SO much better! It's only been a week, but I am so much better. I can't, obviously, go out and run a marathon yet, but I just feel better and when your brain is sending that message to your adrenals, you'll get better!! Also, I found out, that it is imperative if you have adrenal issues to be in bed by 10 so that you are well asleep by 11. The reason? Because our bodies go through a hormonal cascade while we sleep. it's what heals us. And around 11 o'clock, your adrenals kick off to start the cascade. If your not asleep, then your adrenals will tell your brain that the energy is needed to keep you up instead and you'll get a second wind making it very hard to sleep until much later. Go to bed early. Nature didn't intend for us to be up late!! Thank you Susan for sharing what worked for you. I just put that book on hold at the library because like you-it seems that nothing is truly helping. Maybe I will have success with the suggestiong also! Kelly- let me know if you have any questions…..I hope you like the book! 🙂 We'll get through this together! !